To call this film an acid trip on celluloid would be to to undermine the nature of this film. 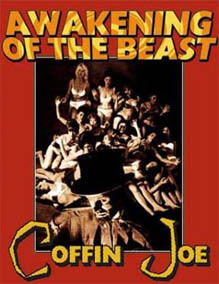 José Mojica Marins developed the character Coffin Joe and carried him through two sequels, This being the last. This film views upon drug use and urban violence in his beloved hometown. Upon release of this film the Brazilian dictatorship outright banned this film. Never before has it done such a thing. It sat in a vault for 20 years and only until 1989 was it finally released. To understand the importance of this film, one must know of the history of Coffin Joe. Coffin Joe first appeared in "At Midnight, I'll Take Your Soul", Brazils first horror movie. It was an atmospheric horror film and paved way for new standards. From that day forward, Coffin Joe is considered Brazil's national boogeyman. His prospect on life is that their is no god. We were based on contiunity of our blood line. I really got to hand it to Marins for making this film. He used negatives from other film directors at the time. It was ragdoll composed and was even arrested during the filming due to a rumor there was real drugs involved. Funny part is that cop that arrests him plays the sleazy film producer. The plot is a psuedo documentary showing the effects of drugs on teenagers and adults. A group of psychiatrists experiment with four volunteers depicting the effects of LSD when mixed with the ideas of Coffin Joe. What begins as a mild trip on black and white film turns into a Kafkaesque funhouse of horrors in color. Frenzied and hypnotized, the hapless volunteers are stuck in purgatory but what is to blame for these happenings? Is it the drugs or perhaps Coffin Joe? The film is composed of vignettes which resembles parts of Der Todesking. From seduction, to drug abuse, and to the perversion of modern youth. 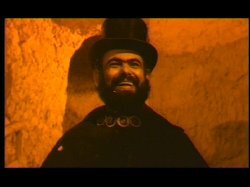 Coffin Joe might be the creepiest guy around. Sporting his Black Top Hat, Talon like fingernails and is a cold-blooded philosopher. From a casual cinemagoers perspective, this movie is as deep rooted as they come in terms of culture and drug awareness. For such a dated film, it doesn't lose any of its power and has stood the test of time.